Inspired by a look from Rachel Antonoff’s 2014 spring fashion line, light and dark blue alternate in a floating heart pattern. Begin with a base coat of navy on three nails and light blue on two. Using the dotting tool, make two dots near each other that will make up the top of the heart. Drag some paint down to make the heart’s point. Use light blue over the navy, and vice versa. 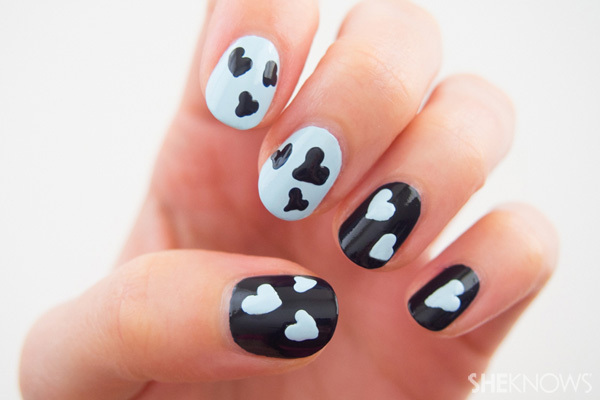 Make more hearts on all the nails, a few on each nail. To get the nail design right, make them look like they’re floating away in the wind (not a perfectly symmetrical heart). Let dry and finish with a top coat.